Here’s a funny similarity between Japan and Kansas. 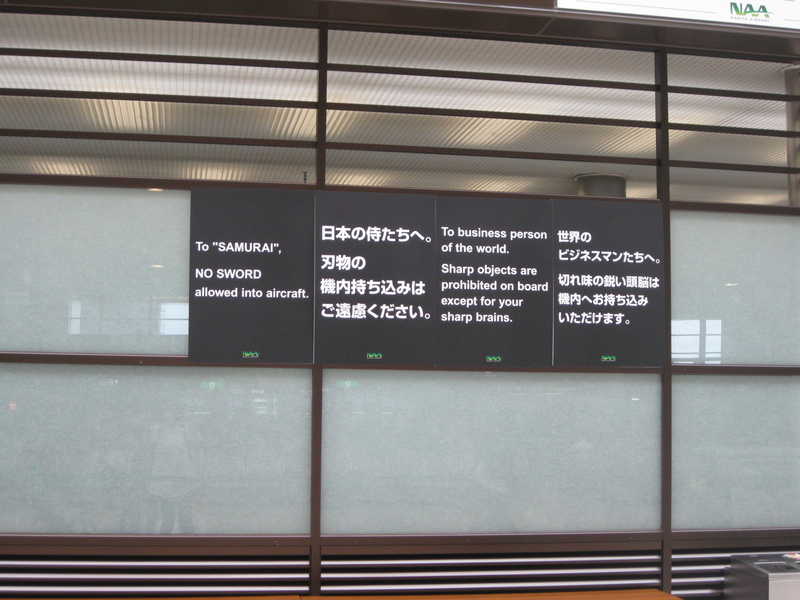 As one goes through security at Narita airport, one sees this sign. Ha! No sword in aircraft, samurai-san! And in Kansas one sees signs on the doors of all kinds of public buildings that say “No guns.” Ha! No gun in school, cowboy! I point this out because Chip and I just got back from a lovely long visit to Kansas. It was a perfect break from the Land of Rain and Pavement: clear air, sunny skies, bright foliage, and wide open spaces. It was funny to see Chip discover the wonders of America: Sesame Street, grass, backyards, playgrounds, grandparents, stairways with wide carpeted steps, dishwashers, Halloween decorations–particularly large inflatable ghouls in yards, homemade baked goods (Mama went on a bit of a baking spree), and the toy aisle at Target. It was fun for me to rediscover the wonders of America: daylight savings time, pumpkin-flavored everything, Chipotle, haircuts in which one has a good chance of leaving with the desired results, Mad Men live, reading things, eavesdropping, football on the TV all weekend (except the Chiefs start losing the minute I come back), wide streets, sidewalks, big maple trees, songbirds, train whistles, brunch, and old friends. Accompanying Dad/Grandpa on a business call to Council Grove which featured two places of scenic and cultural importance: the Flint Hills and Dairy Queen. 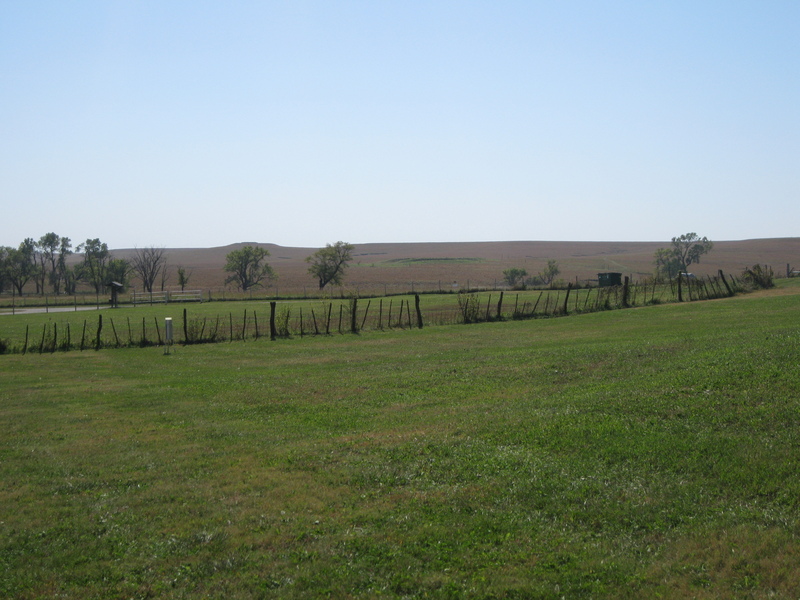 The Tallgrass Prairie Preserve south of Council Grove. All the grass! A site for sore Japanese eyes. 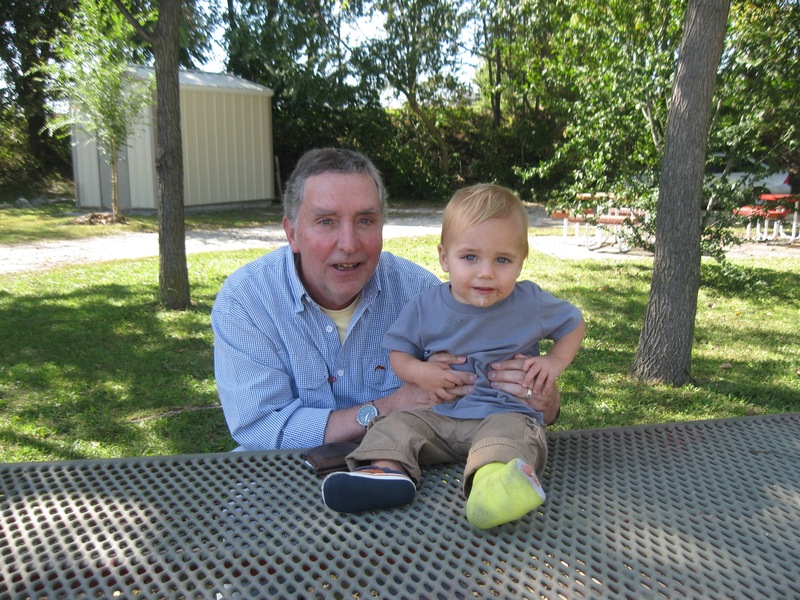 Chip and Grandpa at the Council Grove DQ. Note the new yellow "sport cast." 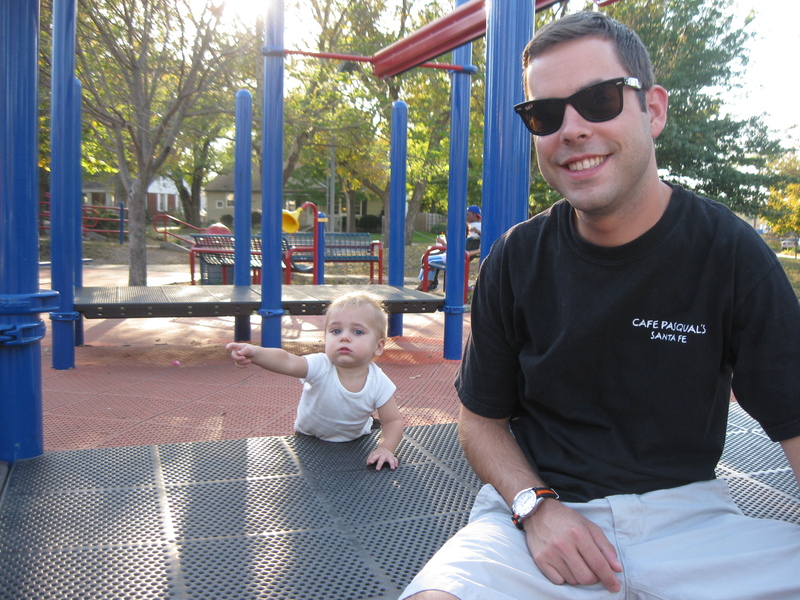 Several trips to the playground. Hey cool guy! Uncle Andrew! In Japan, this would qualify as a full-size vehicle and trailer. 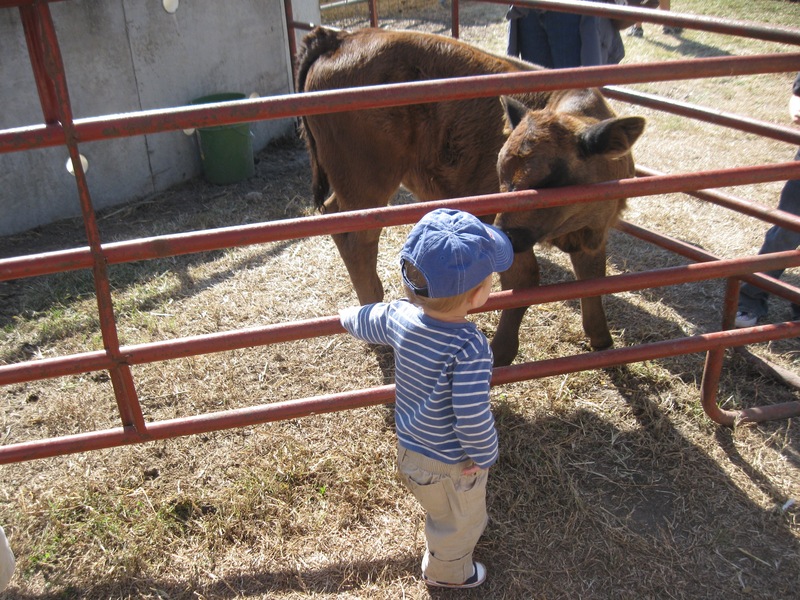 A trip to the farm to pick pumpkins and learn that animals are real. I could literally see Chip’s little brain processing the mind-blowing information that chickens are not just pictures in a book. Chip was very brave around the cow. Until it mooed. Then he sat down in the dirt and cried. 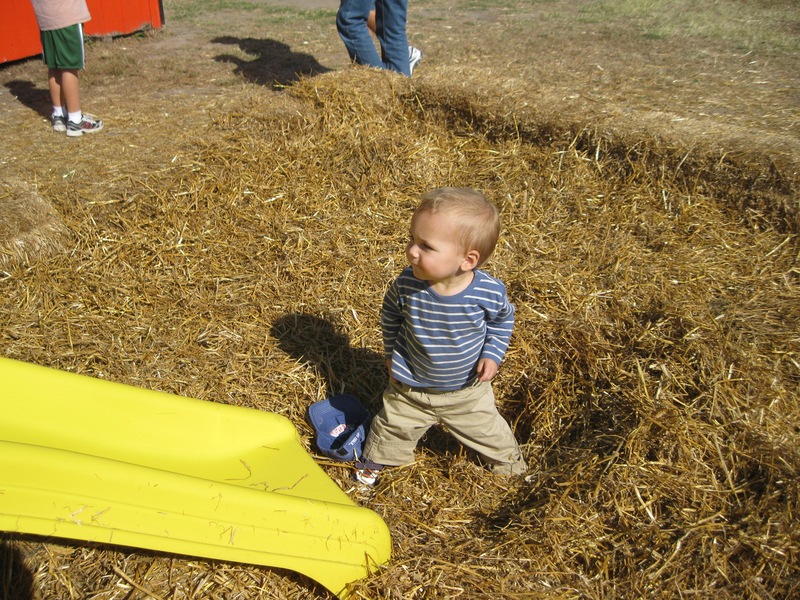 Chip sticks the landing on the hay slide. Visiting Grandma Betty at her school library and getting to play with an entire box of remote controls, watching her hermit crabs (from a distance), and running around the school gym. Twice the doting: a visit from Grandma Elizabeth, too! Playing with our new old friend Alex. The trip was worth every second of plane travel it took to get there, which is saying a lot. Chip looks good in his sporty cast! Sounds like a great trip. 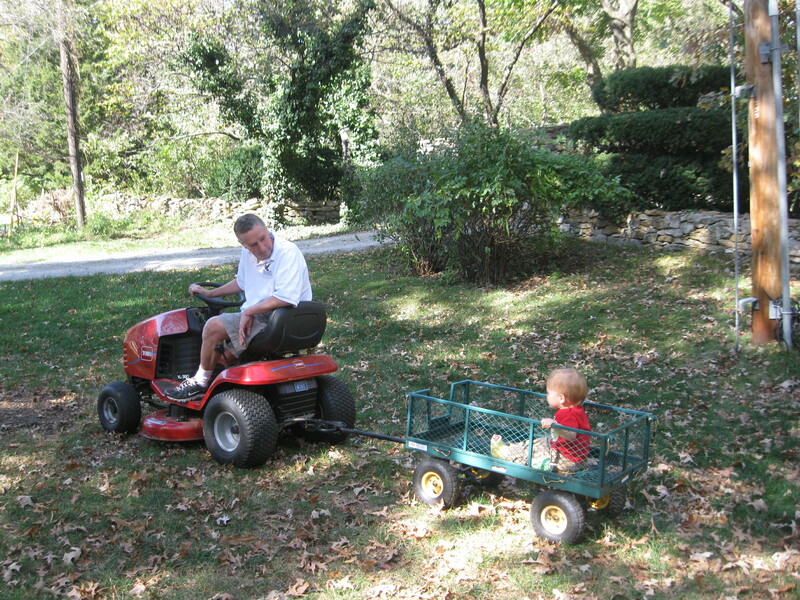 I love the photo of Chip being pulled by the lawn tractor. Glad you’re safely back to Japan and that you didn’t get caught in customs with your sword. I am so glad you had a lovely trip, and I laugh thinking about Chip’s encounters with real animals! 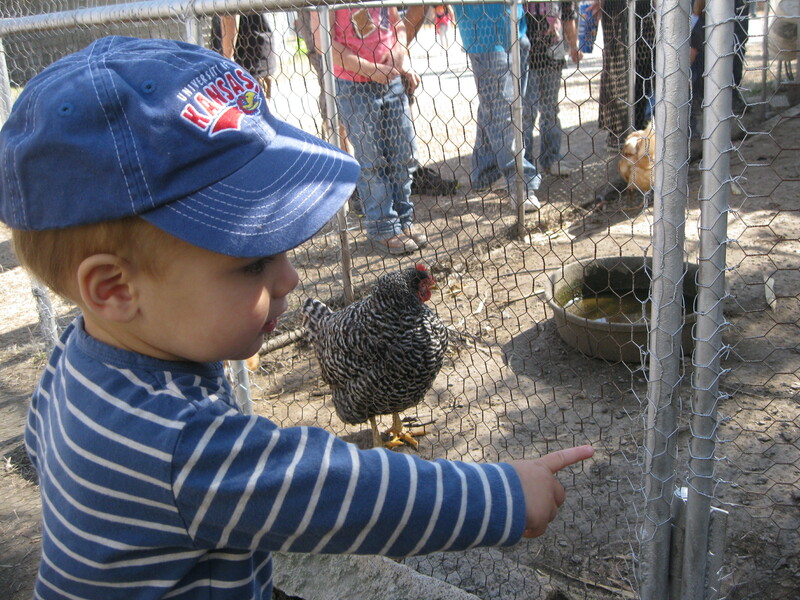 Hope he can meet our chickens one day. Those are wonderful pictures. Thank you for posting them! It looks like Chip had an amazing trip. 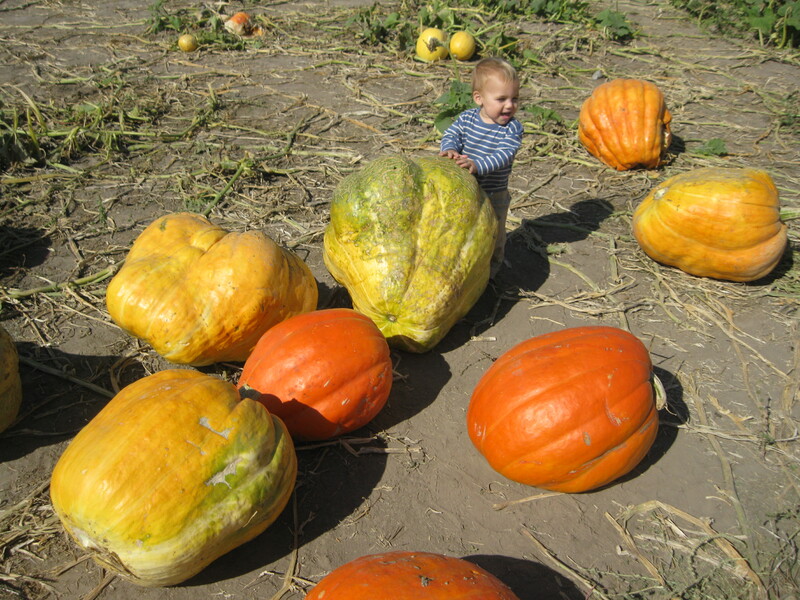 Finding gourds in the kindling box and airplanes in the bathtub. We miss you greatly and wish Rob could have been here with us, too. Thanks for coming! Betty, your comment is priceless. I’m still finding Rob’s ships and airplanes in the tub. The apple doesn’t fall far from the tree.